Minnesota is home to 17.3 million acres of forests. 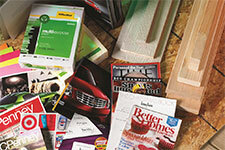 Purchasing wood products made in Minnesota supports jobs and family forest owners by bringing money into rural areas. Nearly 300 Minnesota cities sell goods and services to the forest products industry. Statewide forest products manufacturing facilities sustain and enrich local communities by providing jobs, taxes and infrastructure. The forest products industry is Minnesota's fifth largest manufacturing sector by employment. It provides over $16 billion in economic impact and creates 62,800 jobs. 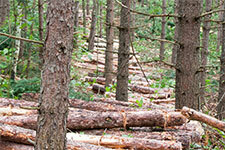 Thirty percent of all wood fiber in Minnesota comes from DNR-administered forest lands. This wood fiber is used primarily to make paper, pulp, engineered wood products, lumber, pallets, animal bedding, biomass energy and specialized cellulose for products like clothing. harness market forces to provide enhanced opportunities for sustainable forest management. Sustainable timber harvest and efficient and wise utilization of our wood resources are crucial to maintain a healthy economy and environment because most forest management is done through commercial timber harvesting and wood-using industries are an important element of Minnesota's economy. Minnesota Primary Forest Products Producer Directory lists sawmills, pulp and paper mills, oriented-strand board mills, veneer mills, and dry-kiln facilities in Minnesota. Minnesota Secondary Forest Products Producer Directory lists wood-product manufacturing companies, including those that make furniture, cabinets, doors, fixtures, and log homes. Markets for Urban Wood With an Emphasis on Ash provides tips for finding markets for urban trees to reduce costs of removal. Twin Cities Sawmill & Dry Kiln Listing- Updated Aug 2012 lists sawmills and dry kilns that serve the Twin Cities metro area, some of which use small volumes of urban wood. Is My Yard Tree Valuable as Timber? helps landowners determine the value of their yard trees. The Marketplace Bulletin is a quarterly newsletter that features articles of general interest to foresters and those in the wood industry. The Wood Product Business Assistance Directory helps Minnesota's small- to medium-size wood product businesses find technical assistance in marketing, financing, and general business areas. Estimated Impacts of Emerald Ash Borer (EAB) on Ash Timber Supply in Minnesota analyzes potential annual ash timber volumes under several emerald ash borer mortality scenarios to inform marketing strategies for ash timber. Economic Contribution of Minnesota's Forest Products Industry – 2011 edition Forest products manufacturing is the fifth largest manufacturing sector in Minnesota with a total economic impact of $17.1 billion shipments, $6.9 billion value added, 86,775 jobs, and an estimated total state and local tax impact of $621 million. Approximately 40 percent of all forest products manufactured in the state are used locally, with the balance being shipped to other states and exported. For timber harvested in Minnesota, the value added impact of primary manufacturing is $230 per cord and $24 per $1 stumpage value. Softwood Sawtimber Supply Analysis contains information useful to informing discussion and decisions affecting softwood resource management while maintaining a healthy softwood sawtimber industry and healthy, productive forests. Development of Procedures to Assess Brushland Resources for Woody Biomass Energy Markets Brushlands have the potential to provide biomass for energy, particularly in northern regions where these land types are common. A pilot project was completed to assess shrubland density over a several-county area using a combination of onsite biomass measurement and remote sensing. Additionally, a simple technique for appraising brushland biomass volumes for markets was developed for use by field resource managers. Minnesota Logged Area Residue Analysis Logged area residue is the wood material remaining on a site after merchantable timber has been harvested. The type of material typically left is the tops of harvested trees, branches, leaves. Standing trees too small to harvest or reserved clones within the harvest area; and wood that has an underdeveloped market or is a poor form and thus not marketable. Minnesota's Forest Resources is an annual publication with information on Minnesota's forest resources and forest industry and trends impacting them. Minnesota Wood Waste Studies—1994 identifies volumes of wood wastes generated in a number of categories and quantifies how these wastes are currently disposed of or used. A Report on West Central Minnesota's Red Cedar Resource 2004 thru 2006 presents an analysis of the red cedar (Juniperus virginiana) resource and potential markets in west-central Minnesota. Minnesota Residential Fuelwood Survey is part of a long-term effort to monitor trends in the use of fuelwood by residential households and the impact of fuelwood on timber harvest levels. Special, or nontimber, forest products include plants that can be used for a variety of purposes, including botanical and medicinal (e.g., ginseng, goldenseal), foods (e.g., mushrooms, berries), decorative (e.g., boughs, spruce tops, birch bark, ferns), seeding (restoration and nursery stock), and and woodwork (e.g., diamond willow sticks, burls). Minnesota's Special Forest Products reports on marketing opportunities in special forest products, including decorative greenery, dried florals and ornamentals, herbs and medicinals, decorative woods, cones, and smokewoods and flavorwoods. Minnesota special forest products harvest to market directory- (updated Feb 2013) lists some harvesters and purchasers of special (nontimber) forest products in Minnesota, including boughs, spruce tops, seeds, berries, and decoratives. Developing Red Cedar Essential Oil Market in Minnesota: Economic Opportunity for Rural Development? explores the possibility of developing a market for red cedar essential oils and other red cedar byproducts given its moderate presence in the Prairie Country RC&D area in west-central Minnesota. Birch Top, Cedar and Willow Careful Harvest Fact Sheets contains information on careful harvesting considerations for three more Minnesota special forest products. Balsam Bough, Lycopodium and Birch Bark Careful Harvest Fact Sheets contains information on careful harvesting considerations for three of Minnesota's most common special forest products. $23 million-plus annual industry in Minnesota. Taking Balsam Boughs: Minnesota's Balsam Bough Industry describes balsam bough harvesting and permit requirements. Balsam Bough Regulations: Pocket Guide offers a portable version of balsam bough regulations. 2003 Minnesota Decorative Spruce Top Production and Market Survey examined the market for decorative spruce tops in Minnesota in 2003.